A new kind of foodie. I’ve been happily tucked away, these days of late, cooking and empty-nesting and enjoying the transition to cool weather and shorter days. My acid-reflux is almost entirely under control, without medication, which in the (modified) words of our Vice President, is a big freaking deal! I’ve been meatless since Sept. 8 and I haven’t missed it once. 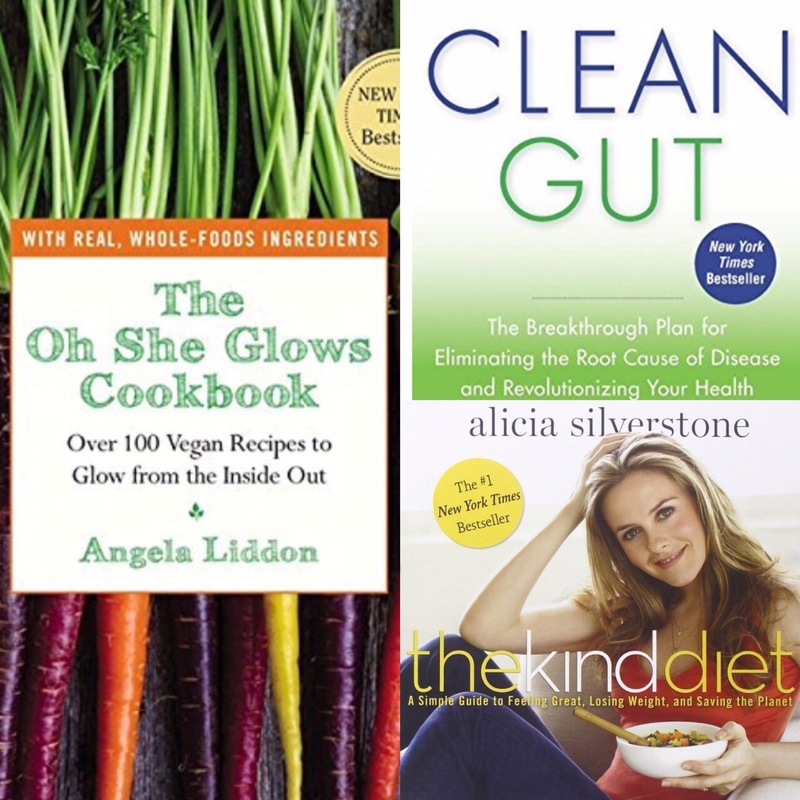 I bought two new cookbooks and it’s been a culinary wonderland in my kitchen. If you follow me on social media, you know I’ve posted endless photos of my new, healthier approach to eating. Despite having dabbled in vegetarianism for years (actually, I’ve called myself a flexitarian many times), I’m still a little surprised how good food can be without meat when you put your mind to it. Let me be clear, though: I haven’t given up all animal products. 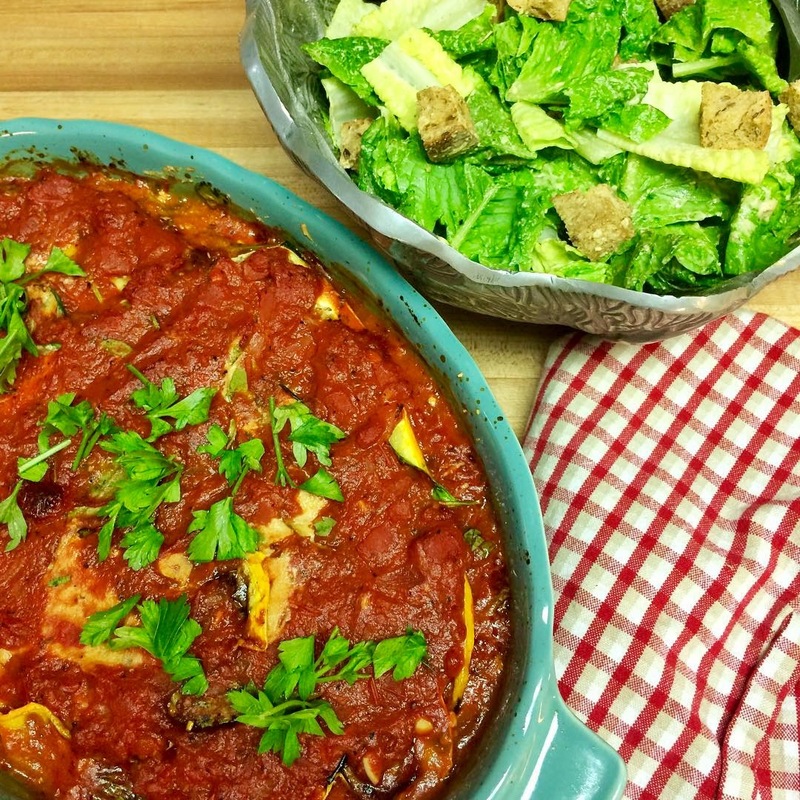 I still eat yogurt and cheese daily, and I eat eggs a few times a week. 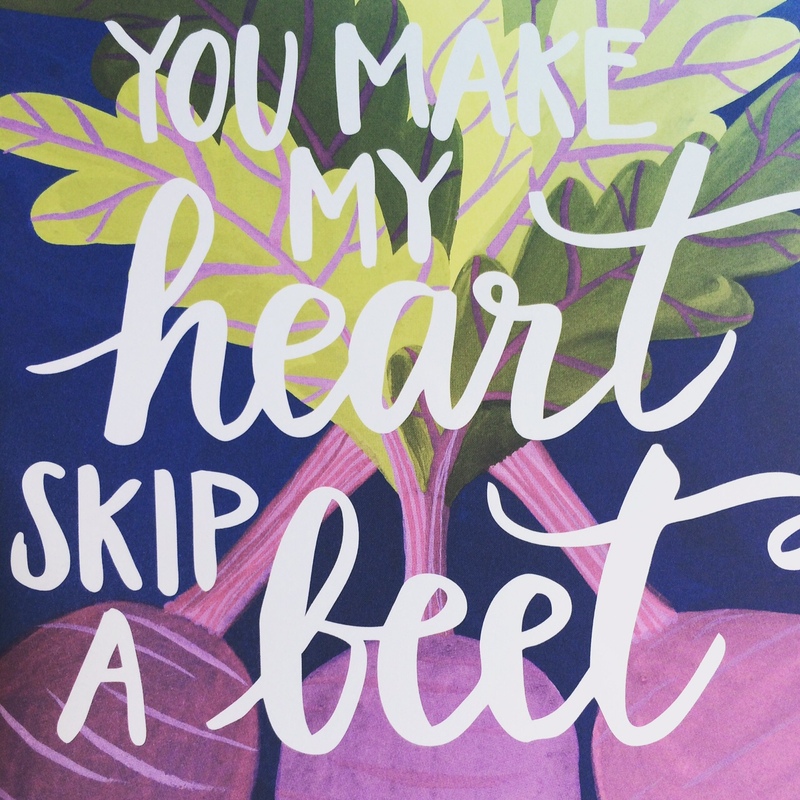 You won’t be surprised to hear that my partner in crime, who’s always been more than happy to follow my lead in the kitchen, has lost 20+ pounds. Don’tcha just hate men and their metabolism? Still, I’ve lost half that amount, without trying. I didn’t set out to lose weight, though I certainly needed to. I set out to cure myself, and I seem to have hit upon the recipe: meatless meals + much smaller portions + no eating at least three hours before bedtime, which for me means no food past 6:00 pm. I’m also taking a probiotic supplement and digestive enzymes with each meal. 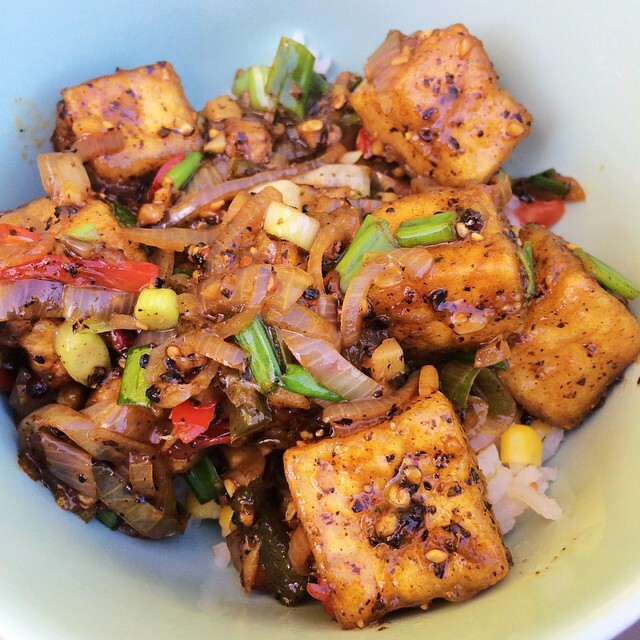 This black pepper tofu was Asian-restaurant quality. 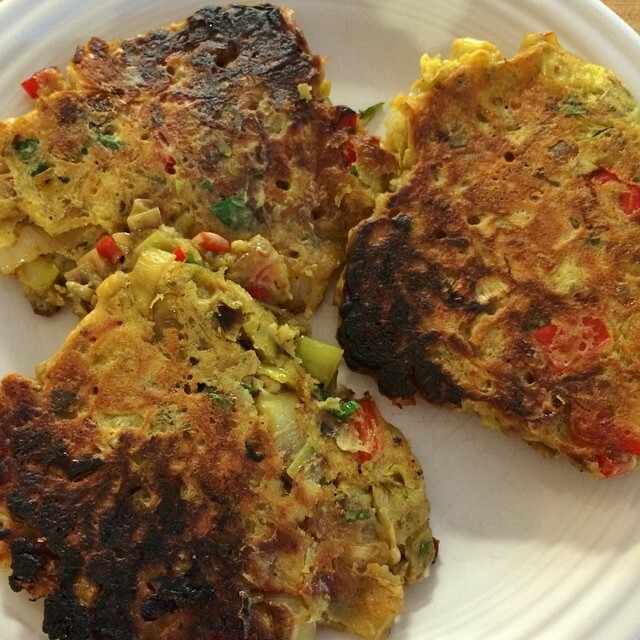 These leek fritters were filling and comforting. 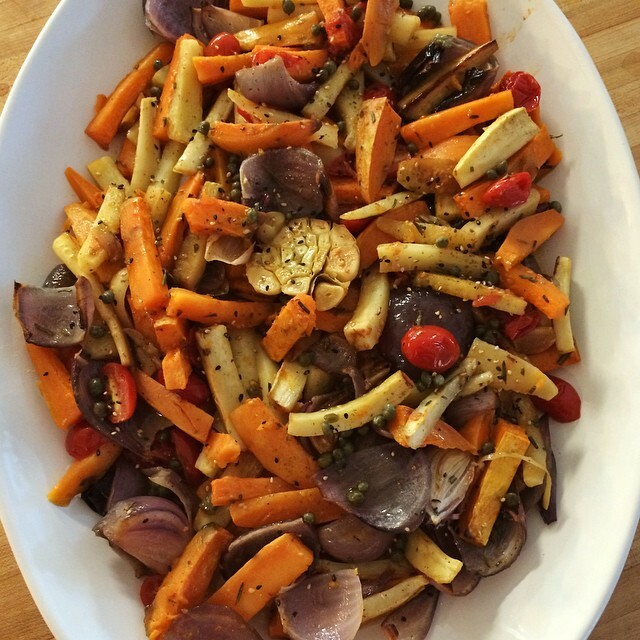 These roasted parsnips and sweet potatoes with caper vinaigrette were a platter of health and beauty. 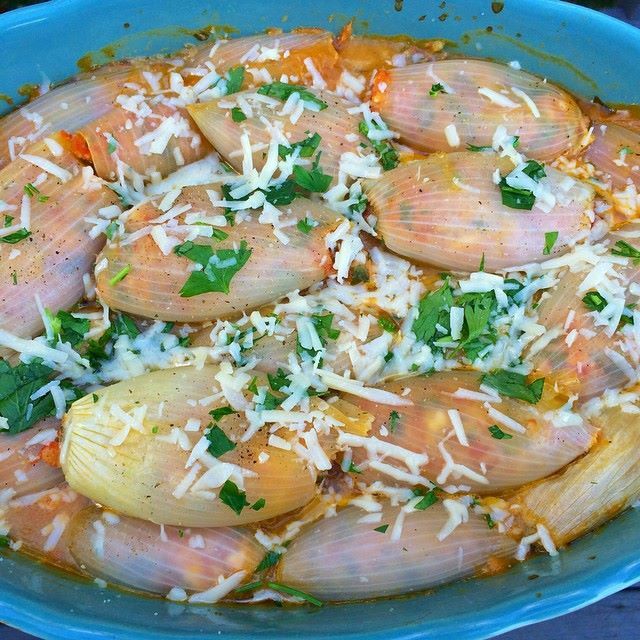 These stuffed onions were mild and sweet and reminiscent of stuffed shells — a perfect alternative to a heavy, baked pasta dish. 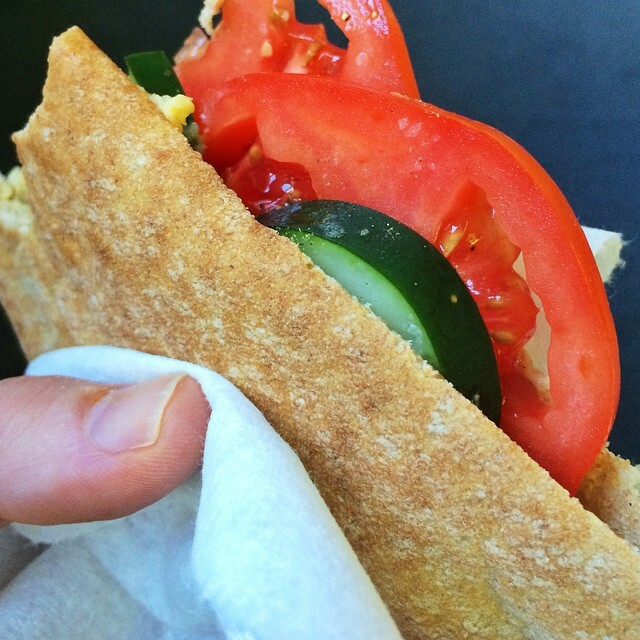 This pita sandwich with black bean hummus and veggies was a perfect lunch on the go. 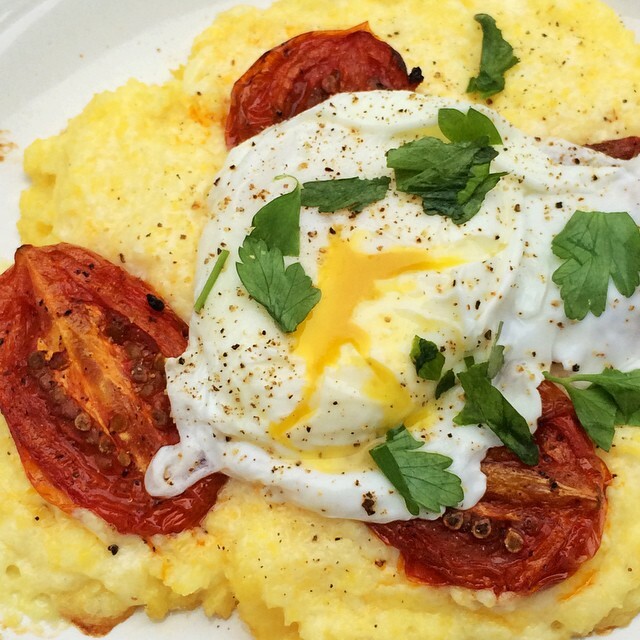 This creamy polenta with slow-baked Roma tomatoes and a poached egg is a perfect weekend breakfast. I’ve also made black-bean burgers, Indian hash, tofu enchiladas with green sauce, lentil/quinoa pilaf and salads galore — all of which delighted my culinary sensibilities while protecting my GI tract. 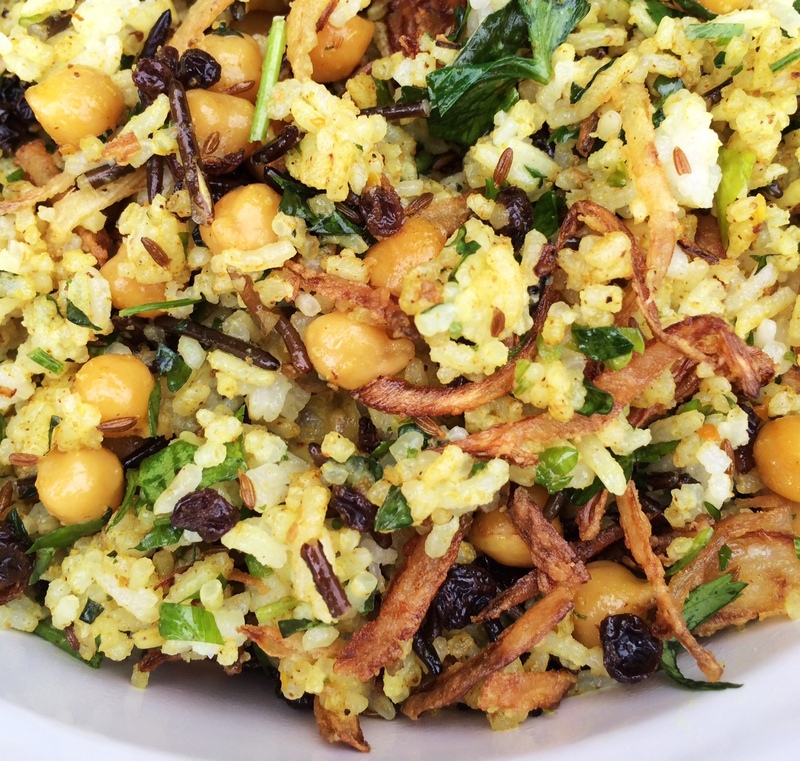 The combination of two kinds of rice with chickpeas (spiced with curry powder), sweet currants and fried onions is unbeatable! 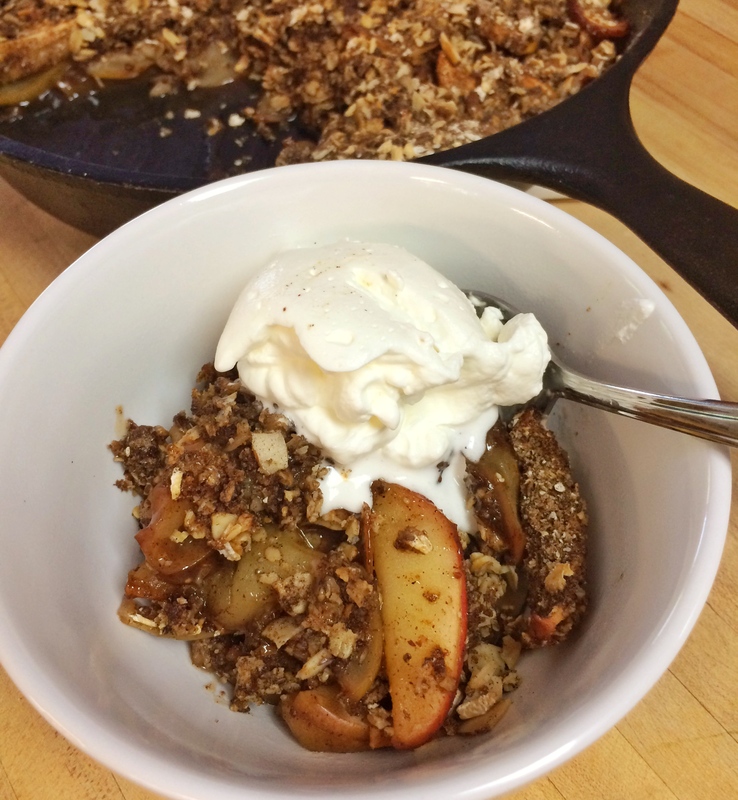 If you’d like the recipe, click here. I’d recommend you triple the amount of curry powder in the recipe as I did. You won’t be sorry. By the way, if you have a well-stocked spice pantry, I also recommend you make your own curry powder. I used this recipe, with the only modification being I doubled the amount of ground chili pepper. I guess you can tell by now I’m not afraid of a little heat in my food. I have two dear Indian friends and their culinary influences and tutoring have definitely rubbed off on me. In eight days, Mr. Mom and I are heading to one of America’s culinary meccas to celebrate our 23rd anniversary. I planned our vacation to New Orleans before I turned over a new leaf, but I’m confident I can eat well there while staving off reflux. I plan to indulge in my favorite treat — oysters on the half shell — hopefully without incident. Whether I can spend an entire week in the French Quarter without succumbing to the allure of beignets remains to be seen. I’ll no doubt take a ton of photos and let you know. In the mean time, Kate’s coming home for Fall Break, I’m working a 60-hour week due to a flurry of special events, and we’re celebrating Parker’s 19th birthday (with Kate as Executive Chef for our family dinner Thursday night!). I’ll circle back around when the dust has settled to catch you up.